That's awesome. The old 95-96 analog huh? I like it. For the 2nd run in a row, 12z Euro trying to push the cold farther south during the middle, and more so, at the end of next week. A pretty potent cold shot in the works and the ensembles are picking up on it. Largely below normal next week after brief spikes AN in between systems. 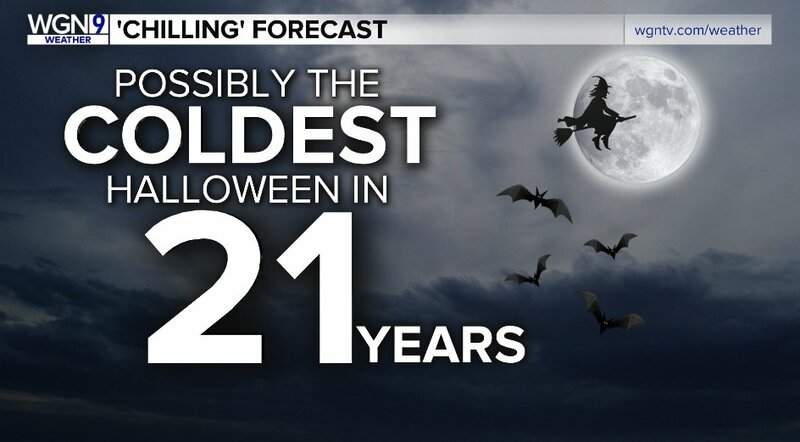 Would be the coldest air of the season if that should work out. November 2nd week (next week), especially by middle of week, will feature some really chilly temps. My highs stand a shot at near 40 for highs. November's progression (forecast, obviously) looks spot on awesome from where I sit. A few days ago, the Euro was showing upper 70s here next Monday. It sped up the front, so Sunday became the warm day. Yesterday's run had low 70s here sunday. It has continued to speed up the front, so now it comes through midday Sunday. Our high temp Sunday is down to mid 50s, which is only avg. GFS painting a nice 1" qpf streak across SMI.. There is 10" of snow right there had this been deeper into the colder season. Great times ahead. Very interesting how the euro keeps getting colder every time i look at it. It kept doing the same thing during the winter of ‘13/‘14 due to the -EPO/-WPO tandem. Playing catch up? I got this feeling the pattern in Nov is going to have plenty of cold HP’s sliding S/SE out of Canada. The Dakotas need to lay down a snow pack and we all are going to be in business heading into late November. 2nd Winter Weather Advisory of the season. MPX bumped totals for tomorrow to 2-4”. Bring it! Jealous! Only 3 hours south of you! Looks like more snow chances Friday night especially just north of the twin cities too. Gfs and nam showing several inches possible. Mid month looking interesting each model run. Looks like its snowing over OMA this morning...could be virga though...folks near INDY had their first taste of snow early this morning as that wave out in the plains made its way across the Midwest. Meaning basically, the GFS right? Only model that goes out that far. I guess if you're reaching beyond d10, it's better to see interesting vs boring. This is the season when exciting things in fantasy range may actually not be a mirage, as they've been in years past. Love the way temps really drop during Nov, and there's a shot of legit winter wx for SMI beginning this month. And, in cold and/or lucky years we can get some decent early winter storms. Ofc, one of my all time favorites was the Nov 15-16, 1989 bliz. It wasn't too bad for snow totals downstate in SEMI, but in NMI where I was at deer camp it was an unforgettable early season storm. Even so, per this map SWMI scored up to 20", including Marshall doing great with 6-8" via the deep SLP and strong NW winds. I'd take that in a heart-beat for this time of year! 00z Euro still keeping the colder look next week but what interests me more is the pattern becomes a bit more favorable for a storm system coming out of the Rockies Day 7/8 and tracking due west/east. HP centered over the Dakotas and the northern tier may be enough to "seed" this system enough cold air to produce a wintry set up. Classic "share the wealth" track but to far out to pin down the details. With the flow becoming more zonal-ish across our sub forum over the next 10 days, these sneaky waves could show up from anywhere. The good thing is, there is an enormous amount of cold air bottling up in Canada to provide the other important ingredient to spur some wintry events. Per the BSR (R stands for Rule btw, no need to add "rule" after), this was highlighted by you a few days back. I think it's totally plausible for that to be maybe an early vs of the Thanksgiving '04 storm. A fully traditional winter storm but dropping maybe 4-6, perhaps 8" jackpot totals. Nothing huge mid-winter but certainly huge for middle 10 days of Nov, especially over our way moreso than the cold prone Plains. Speaking of wintery look - wow at how much areal coverage returns of snow on this 1-Nov radar - Hello winter! I know, but I just do it out of habit and have been for all the years I've been known about it. Speaking of winter, if the Euro Op/Control are right, it's going to feel like mid December for a lot of Week 2! I mean, it won't take much for all the cold sitting in Canada to sneak its way south by a system coming out of the Rockies. I like the look of the pattern over the next couple weeks. Pattern looks very active as the excitement builds for our first true snowstorm. You have to wonder, if this will be a common theme as it has been this Autumn for the models to trend colder. Check out the difference in the 00z EPS from 3 days ago (Day 13), compared to last night's 00z run (Day 10). Cloudy and cold currently w readings in the 30s. Got a feeling the models will trend more bullish with cold over the next two days or so. Welcome to November 2017! Here at my house it starting out cloudy (that is normal for here) with temperatures in the upper 30's (37° at this time) While the leaves had started dropping early this fall at this time here in the Grand Rapids metro area we still have most trees with leaves still on them. I will be taking a trip up Michigan's thumb this weekend will report if more leaves are off in the Bay City area. 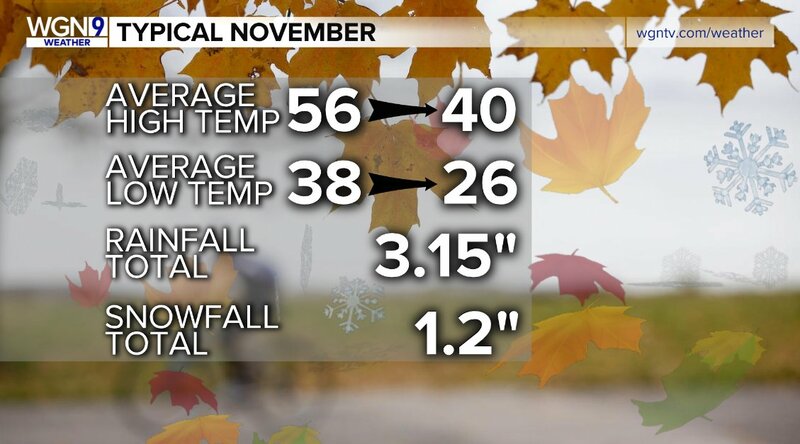 Here is the October wrap for Grand Rapids, MI the average high/low for the month was 64.2°/45.9°. The highest was 82° on the 2nd and 3rd The coldest for the month was 28° on the 26th The mean for the month was 55.2° and this was the warmest October at GRR since 2007. With 9.69” of precipitation it was the wettest October in Grand Rapids recorded history and the 5th all-time wettest month at Grand Rapids. There was 0.4” of snow fall all falling on the 31st but that was -0.1” below average. Huge changes in the models this morning. Looks like MSP going to miss most of the snow. Should fall well north and east of here. You win some, you lose most. Still a few patches on the grass this morning. I suspect those will be gone in the next hour. 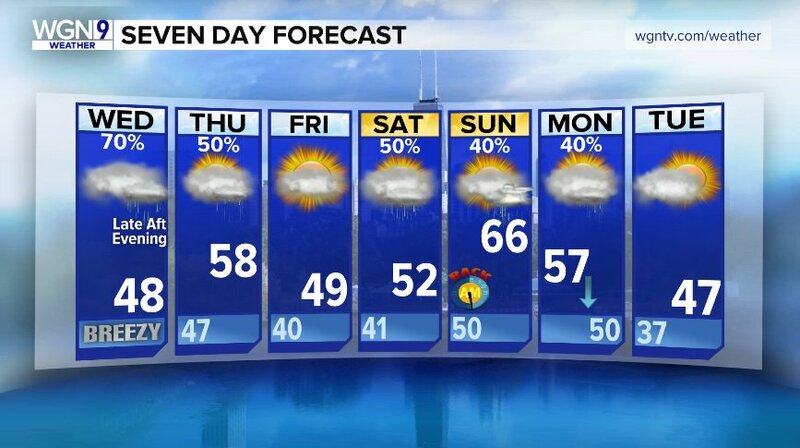 Yo-yo pattern this week in Chi...possible thunderstorms on Sun? There's your winter pattern, right there buddy! Nice to see proof to the truly LR modelling, eh? It's come a long way. Both Euro and GFS are fizzling out that BSR storm as it comes ashore. I have noticed that my temps for next week have been trending colder and colder. Great sign! Models are beginning too develop a system for the middle of next week for the plains. Strength and amount of cold air varies but looks like something to watch at least! LOL. The classic in between for Omaha. Hopefully its the start of a trend! GEM and GFS are showing it. I have a chance of T'stms on Sunday w highs in the 60s, maybe better. Lt snow and wind right now! The projected EML seems powerful, which is both good and bad. The bad being complete convective inhibition for anything surface-based. Good being is that it could keep things more discrete. Some people who are pretty good with this stuff seem fairly on board, so I assume they expect the EML to not be that much of an issue, and able to be broken. Trends lately have been for models to underperform on everything, temps and precip. I am watching this closely. Agreed. Today was supposed to be mid 40s and a small chance for lt. rain. Its been been spitting snow pellets and stuck in the upper 30s. Looks like a good amount of rain coming tanite into all of Thursday. SEMI will experience a brief warm-up as well. Snow finally started here. Legit fatty flakes at the moment. Temps are a tick above 32 so probably won’t stack up too much. But I’ll take it. Enjoy! Even if its not sticking on the ground, the joy is still there by just looking at it falling from the sky. Sun angle this time of the year is low, so it might stick, especially during the evening hours. On my phone, but the 12z Euro is flashing big potential for the 10th/1th period. Still showing the mid week nex week system. Pattern is looking more like winter next week! Sticking to the grass and car hoods here as well. Good start to the season for sure. Just don’t steal all of the snow down there again this winter. Radar trends snow ending here soon, but getting large flakes accumulating on the grassy areas as well just north of the Twin Cities. Kinda disappointed in how models performed, but hey, snow is snow! *Sees who did it* Okay that explains it.